Now, you can change your hairstyle as often as you change your clothes with a hair accessory that can be worn a different way every day of the week. 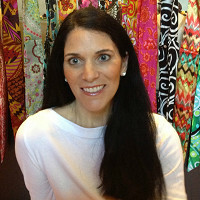 Made in the USA by Weberline Couture, Hair Candy is available in a variety of vintage, retro-cool prints. The ingenuity of this scarf-like headband is the elastic loop at its base that keeps it securely in place. No fidgeting or re-tying necessary. Invented by company founder and designer, Melissa Weber, Hair Candy gives you the flowing style of a scarf with the fit and functionality of a headband. 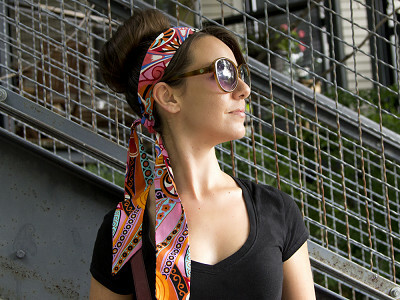 Let the scarf tails fly free for a more bohemian look. Tie them in a flirty knot or pretty bow on the top of your head or at the base of your neck, centered or off to the side. You can even braid the ends of the scarf right into your hair or use them to tie a pony tail--fits any head size and any occasion. With so many ways to wear it, Hair Candy gives you plenty of looks to choose from. Now for the hard part—deciding which style to try first. Hello Fashionistas! I am very excited to share with you my newest hair candy design. 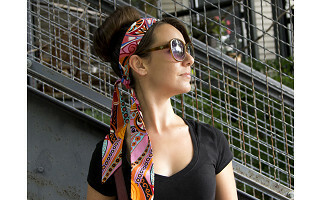 You can now hold your hair back in style with Weberline's unique elastic hair scarf/headband combinations. It's the perfect accessory for this seasons' trend-setters. The elastic loop design fits stylish women, juniors and children age 8 and over. You are sure to be an individual, as each piece is specially created by hand, making no two exactly alike. I have been designing and manufacturing fashion accessories for over 6 years now and am so excited to share my newest creation with you. I will be here all day to answer any and all of your questions. Don't be shy, feel free to ask me about the many different ways you can wear my design! I have a question about the stretchy loop...that part of the video is a little blurry and goes by too fast. Is it like a regular hairband attached to both sides of the scarf? do you put your hair through the loop before tying the scarf? I love this idea because I love to wear scarves this way, but they always slide! Great question! The elastic loop is a circle so you can put your ponytail through the loop if you choose but it is not necessary. The elastic loop will stretch only as far as necessary to hold the hairband in place at the back of your neck. This way you can easily wear your hair down or in a pony. Hmm..just asked a question but when I checked back it had been removed for some reason? I am wondering about the stretchy loop..is it like a regular ahir band sewn to both sides of the scarf? Do you put your hair through the loop before you tie it? Hopefully this time my comment will not disappear! I see your question here. Nothing was removed - perhaps it was a temporary glitch. Yes, if you are wearing your hair in a low pony tail, you put your hair through the loop and then tie it. The rubber band is attached to both sides of the scarf. Please note however that you don't need to use the ponytail holder to wear the scarf. The scarf works with or without it, whether you have short, long or no hair at all. Hi Melissa, This is a great idea! I am so glad you posted it on Grommet. :) I watched the video, and I have the same question as Kristen has posted: I am not clear on how the elastic band part works. If it will keep the scarf in place, then I am already a fan, as I usually have a problem with headbands slipping or falling off altogether when I wear them! Would it be possible for you to post either a video or photos of how the elastic band works? Thanks! Hi Katherine, here are a few videos that should help. Enjoy. Hi, Have you seen this head scarf on a cancer patient? Does it work? Hi Sheila, it will hold it's place on your head regardless of whether or not you have hair on your scalp. Though please note it's only 2.125" wide, so it will not cover one's entire head. My headscarf is made from 100% cotton fabric. Hi, Thanks for your other comments on the elastic loop, I have watch the three videos but I am still a little confused. Is the loop sewn into the fabric? I have short hair and love the look but since I don't have hair that will fit into the loop, with the scarf still stay in place on my head? HI there! I have a similar question in that I'd like to get one of these for my wife for her birthday but she does have relatively short hair. Will this still work and would you have a picture / video of what this would potentially look like? Depending on how short, the hair tie in the scarf should still work (again depends on how short the hair is) If there is enough hair to make a ponytail, then you should be able to fit through the elastic band. Please note however, you do not need to have a ponytail or use the ponytail holder to wear the scar. The scarf still works well with short hair or long, or even a bald scalp. Now, you can change your hairstyle as often as you change your clothes with a hair accessory that can be worn a different way every day of the week. Made in the USA by Weberline Couture, Hair Candy is available in a variety of vintage, retro-cool prints. The ingenuity of this scarf-like headband is the elastic loop at its base that keeps it securely in place. No fidgeting or re-tying necessary. Invented by company founder and designer, Melissa Weber, Hair Candy gives you the flowing style of a scarf with the fit and functionality of a headband.